Bone Gap is a book you want to go into not knowing what to expect. This is what I did and my mind was taken on a stunning wild ride. I don't think any words can truly describe Bone Gap but I will give it my best shot. Bone Gap is a magical, unique, captivating, and thought provoking read. This story pulls you in from the first chapter. The book is set in a very small town and I loved what that added to the story. You get pulled into the town of Bone Gap and it is like nothing else exists. The townspeople were also fantastic. Every character had a different type of personality and I loved that. There was great social diversity between them and it was very interesting to watch them all interact and go through their everyday lives. My favorite character was Finn. Finn is a boy lost in the clouds and the moment you read his narration you cannot help but immediately feel for him. Talking about feels....this book makes you feel all of them! This book is definitely filled with a feeling of sadness. But it is not a in your face and consuming sadness that upsets you it is written in a way that is underlining and just kind of sneaks up on you. When it is written this way I think it has an even bigger impact on the reader. You will immediately become invested in Finn and all the other characters emotions. The story is told in alternating points of view which I always enjoy because you get to understand enjoy character more and see the story unravel from all sides. I also very much enjoyed reading the budding romance between Finn and Petey. I thought they were a perfect match for each other and added something each others lives. The romance does play an important role in the story and both of these characters growth but the book does not revolve around it. Petey ends up finding something (you will not see this coming at all) that reveals a lot about Finn and what he is going through. This book is a magic realism story. In other words their are some parts that are very unique and will not make sense at first. This is a book the you have to have some patience to read. Things are not revealed until the last couple chapters. When I say you must have patience that does not mean the book is slow. It is not that at all. I actually read the book extremely fast because I needed to understand what was going on and the reasoning behind it. I could not put it down. I loved the magic realism aspect because it makes you think more and it makes the story more mesmerizing and enchanting. The thing that made Bone Gap even better is that it is not one thing. 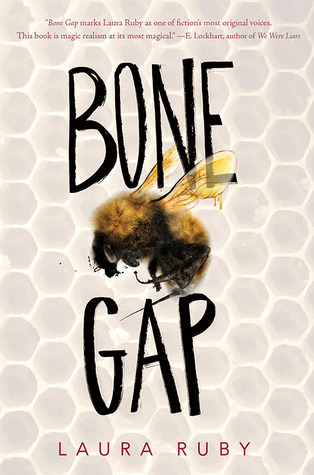 Bone Gap can be interpreted as a contemporary read about these characters and their growth, it doubles as a mystery as you try to discover where is and what happened to Roza, and it is also a unique story about a magical world. Bone Gap will have you entranced in this story and the town within seconds. If you are a fan of magic realism that also enjoys books that make you think and see things differently (also don't forget those feels!) then this is a book I highly recommend for you.